At Dive Downbelow we remain fully committed to help in doing whatever we can to preserve the ocean’s health and its marine life. We also fully support Project AWARE’s cause in fighting on behalf of the ocean. 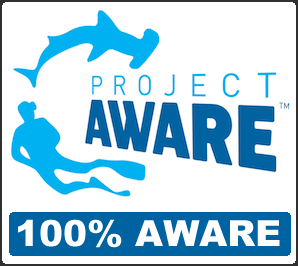 Ever since July 2011, we became a 100% AWARE dive centre whereby for each student who completes a PADI course with us, we donate directly to Project AWARE on behalf of the student. Because of that, all of our students receive an upgraded qualification card with the Project AWARE logo indicating that they too care for the ocean and are ambassadors of the ocean. So by completing a dive course with us, you are not only supporting Downbelow but also supporting the environment. Currently Dive Downbelow is the only dive centre in Borneo that is 100% AWARE. Apart from the donations, we have also shown our commitment to conservation by organising and conducting many activities such as beach clean-ups and removal of illegal nets within the protected area of Tunku Abdul Rahman Park, Borneo. So if you are thinking of taking any PADI course, then go with a dive centre that cares about the ocean and the marine wildlife. Go with 100% AWARE. Go with Downbelow. Check out our PADI courses here. We also have PADI professional courses for those who wants to take their recreational diving to the next level. Please contact us if you have any enquiries on any of our courses or our conservation efforts.